The yellow flowers of the aconite are some of the first to appear in the new year, along with snowdrops. If you don’t have any, think about getting some for planting towards the end of spring, writes the anonymous gardener. 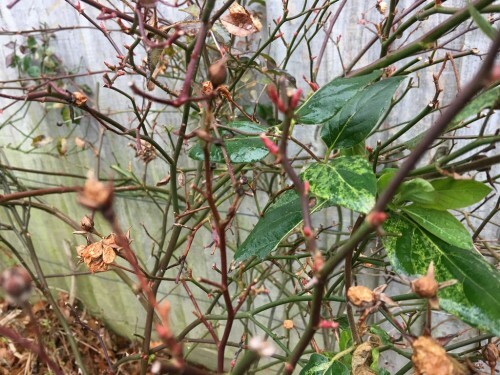 Last weekend I noticed my roses – yes, I do like roses – were beginning to sprout. There were a few tiny leaves and some small buds on the stems. That’s a clear sign the bushes are getting ready for summer – and we must help them. It is just a bit too early for pruning but be ready as February draws to a close and any harsh winter weather appears to be behind us. There is a lot of mystique about pruning but follow these four steps and you will not go far wrong. First of all, take out all dead wood. Third, begin to form a bowl shape with a fairly open middle. Fourth, prune back to just above an outward facing bud, with the cut sloping away. 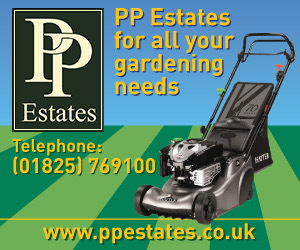 Make sure you use clean and sharp secateurs. Take your time, walk round the bush and enjoy the shaping process. Having given you the way I prune, I have seen in the past suggestions that you get as good as result by just taking a pair of garden shears to the bushes. Too harsh for my liking. Daffodils are looking good with wallflowers at the back against the hedge. 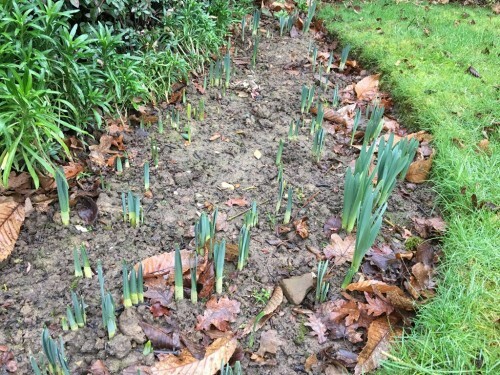 Other signs of spring in the garden are the daffodils coming through but, unlike last year, I have none in bloom. I do like flowers – and in the spring bulbs – just outside the window as well as further away in the soil. 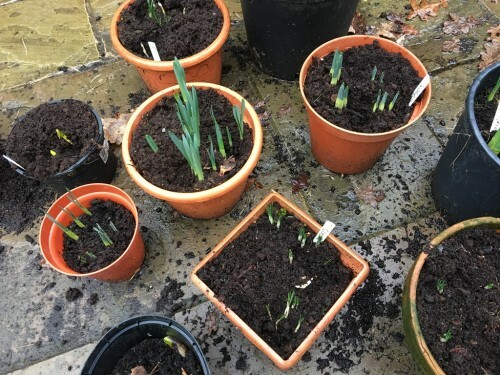 I have many bulbs in pots just close to the conservatory but in the last few months the squirrels have dug away. For much of the winter, I kept the pots netted but now I have removed, squirrels are back digging. I am sure some of my display will have “gaps”. The lawn is certainly a cause for concern. 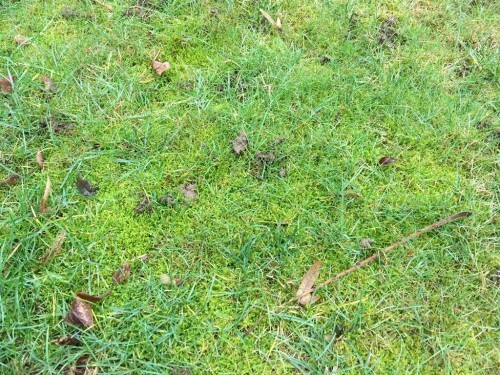 It is a long time since I have seen so much moss, which is a clear sign the soil is compacted. That is going to need some serious work in the spring but that’s something that can be left to March at the earliest. 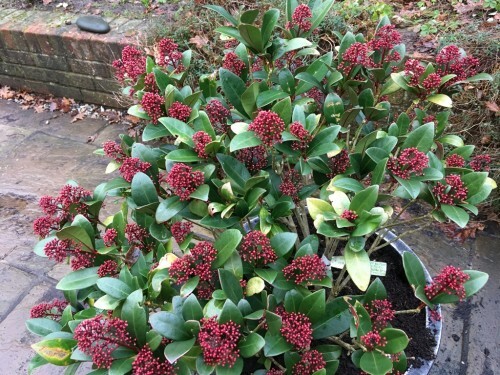 I also just have to show you my skimmia (picture at the top) which as flowered throughout winter. It has plenty of TLC in the autumn and I have been rewarded for my efforts. Vegetables: You will probably do more harm than good by trying to work the vegetable plot at the moment. Garden with the weather; plant when the weather is right are good things to remember. If you haven’t done so already, buy seed potatoes and “chit” them ready for planting in the weeks ahead.